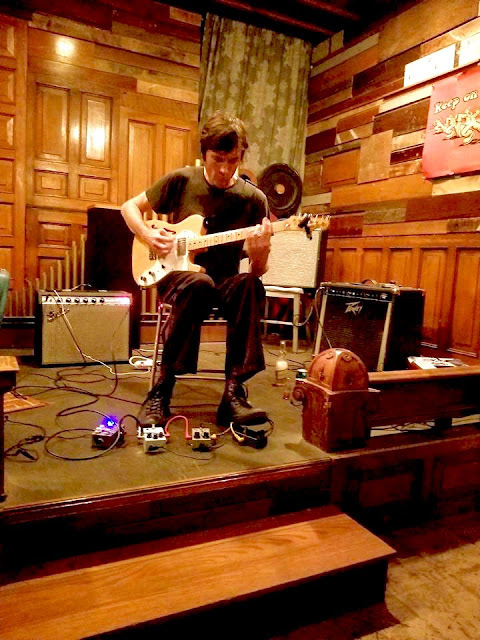 Bill MacKay is a versatile guitarist who is perhaps currently best known as being Ryley Walker's favorite guitar foil when Walker performs in a band setting. He's quite active and plays out very often, as his website (below) shows. 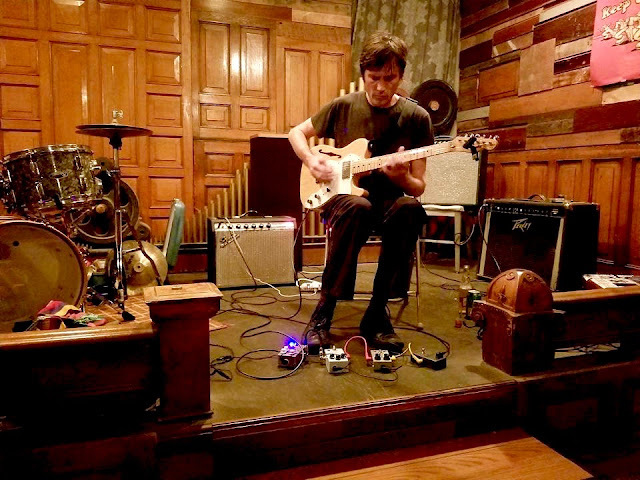 He has an excellent solo recording on Drag City and on October 20, 2017 he and Ryley will be releasing a duo album (also on Drag City (see links below). This was really an excellent performance by Bill -- solo electric instrumentals with a few simple effects boxes. 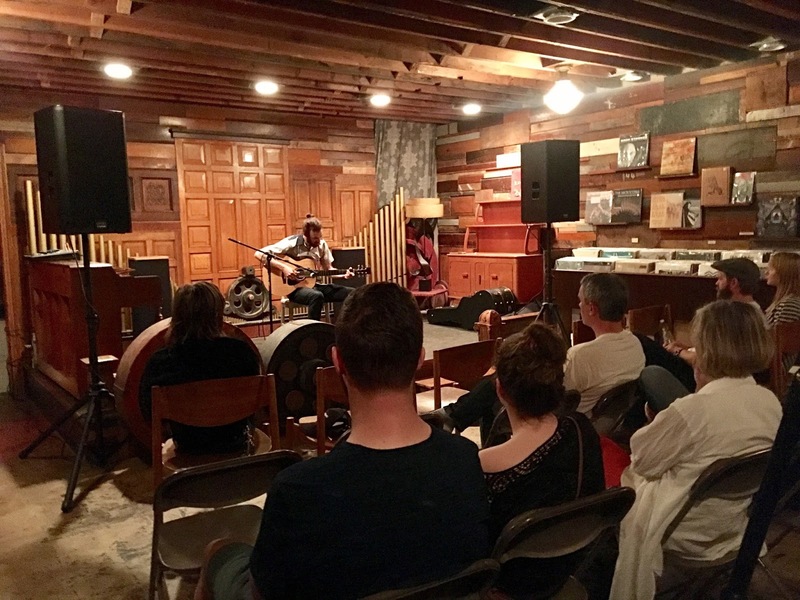 He was the opener for Tashi Dorji and Tyler Damon (with whom he had played in Chicago the previous night). His obvious deep concentration while performing allowed his fluid guitar lines to build and fall into quite beautiful patterns. There was a clear structure with enough freedom to make repeated listenings especially rewarding. This recording was captured by Richard Hayes using a pair of modified Audio-technica AT853 microphones (cardioid) which were fed directly into a Sony PCM-M10 recorder at 24/96 resolution. Software such as Audacity and Fission were used to clean up the sound a little and also to split the tracks. Conversion into ALAC and mp3 were accomplished using the program "xAct." With many thanks to Andrew Lyon for the two excellent photos above. The crappy one below is by me. ALAC = stands for Apple Lossless Audio Codec, which is a method of making a lossless copy of an audio file with about 50% of the space required. With any apple device such as iPhone or laptop, you can natively play these files and enjoy the same resolution as a WAV file (it just takes up half as much space on your hard drive). mp3 - this is a lossy compression codec which utilizes psycho-acoustic "tricks" to drop certain audio information which is not noticeable under normal hearing situations. I am not a fan of mp3 but still find it useful as a high quality mp3 file will take up about 20% of the room on your storage device as a WAV and about half as much as a ALAC file. Please support this fine artist and decent person by going to his shows, buying his merchandise, and talking to him like he is a human being after shows. This was a very pleasant surprise. After seeing several shows at what used to be the main roasting site for Alterra Coffee (remember them?) where the audience chatter had been louder than the performers, I was expecting the very worst at this show. 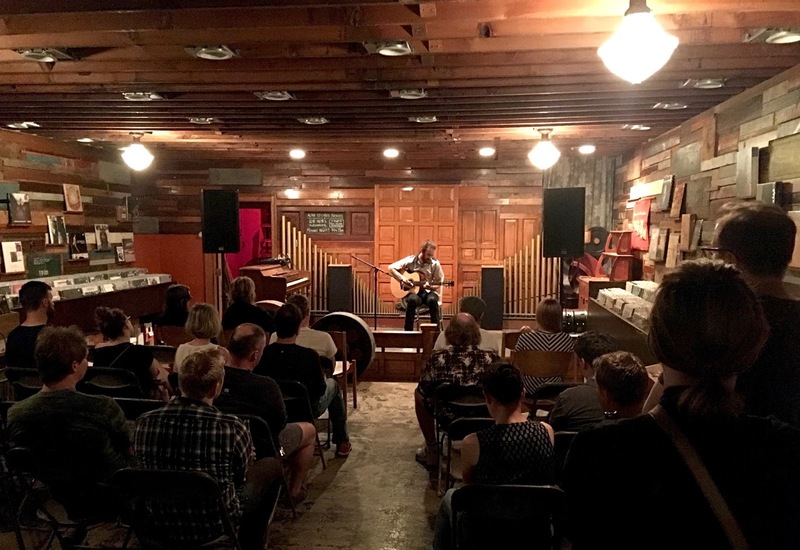 Maybe it was the arrangements of the seating, maybe it was the older average age of the concertgoers -- in any event what transpired was a lovely concert in a lovely space with a polite, attentive crowd. Robyn Hitchcock needs no introduction from anyone and won't get one here. He's a legend who has survived the late 1970s and early 1980s and continues to produce compelling albums up to the present day. 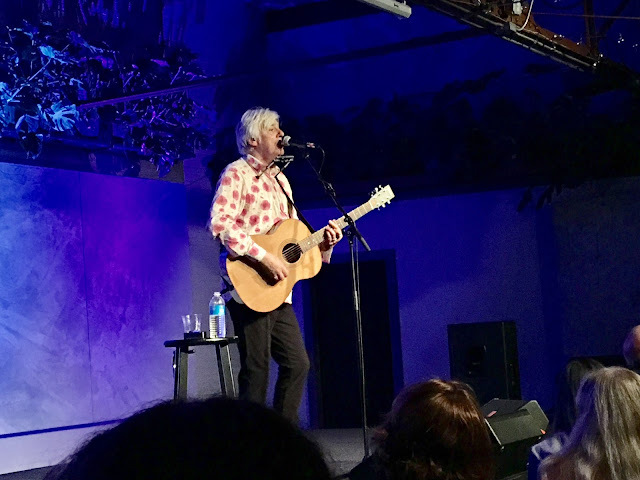 Unlike many of his peers, he does not dwell on presenting "The Best of My Back Catalog" concerts but rather performs mostly new material with some amazing cover songs thrown in for good measure. My recording was accomplished with a pair of my trusted and tiny Church Audio CA14 cardioid microphones (individually hand made by Chris Church in Canada) fed into a Church Audio model 9200 preamplifier. My position, about 6 feet in front of one of the speaker stacks, made for a recording heavy on the music and light on the room acoustics. 02 Banter - "Totally Not the Shank Hall"
04 Banter - "Fractured Democracy"
06 Banter - "Dreamy State"
11 Banter - "Goldfish in the Water Bottle"
13 Banter - "We've Reached the Harmonica Part"
Software including Audacity and xAct were also very helpful in bringing out a full-bodied sound. FLAC, mp3, ogg and other interesting file formats can be found at the Live Music Archive hosted by the Internet Archive at www.archive.org. Individual songs can be streamed (at lower bit rate mp3 resolution) as well. 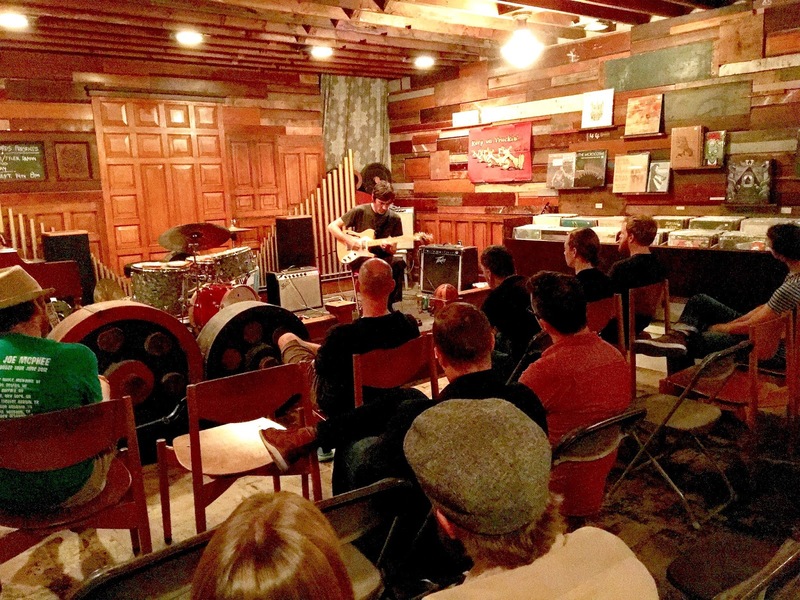 Our second upload is a recording of the opening act for Rob Noyes (our first music offering). It was not easy finding out information about Alexander. A google search was as useless as you might expect. I asked Ken, the owner and overlord of Acme Records, what he knew about the performer and whether or not it possibly was an oversight about the missing last name. He told me that he had very little information about Alexander except that he was coming to town on tour with Rob and that his bandcamp page has some fine acoustic guitar music on it. I checked it out and had to agree. Having met Alexander, I must say that he is an extremely friendly and amiable person (as is Rob Noyes). We talked at length after the show and discovered a mutual love of Indian Classical music and especially performers in the style known as "dhrupad." Needless to say, that was not exactly something I run into everyday. Alexander's music is bit more melody-based than Rob's. He tends to work in smaller units of music, often in 3-4 minute tunes. His picking style is clean and faultless. It bears repeated listenings quite well. I hope Alexander decides to change his stage name a little to aid in getting the word out. I hope you, my dear readers, can check out his bandcamp page and purchase his very fairly-priced cassettes. This recording was captured by Richard Hayes with a pair of omnidirectional Church Audio CA-14 microphones fed into a Church Audio CA-9100 preamp and then an Edirol R-09HR at 24/48. Audacity was used for EQ (including removing several thumps from folks walking around the back of the shop and crinkly sounds from people shifting around in their metal chairs). I like the natural sound of this night's capture -- not a pristine studio date, of course, but a good representation of what the lucky crowd was able to hear that night. mp3 - this is a lossy compression codec which utilizes psycho-acoustic strategies to drop certain audio information which is supposedly not noticeable under normal hearing situations. I am not a fan of mp3 but still find it useful because a high quality mp3 file will take up about 20% of the room on a storage device as a WAV file and about half as much as an ALAC file.